11.18.13 The world champion was unable to generate anything substantial in his second consecutive game with the white pieces. Again playing 1.e4 and running into Carlsen's Berlin Defense, Anand failed to make meaningful inroads and chose to repeat the position for a draw after thirty-two moves. The match score is now Carlsen 4.5 - Anand 2.5 with five games to play. 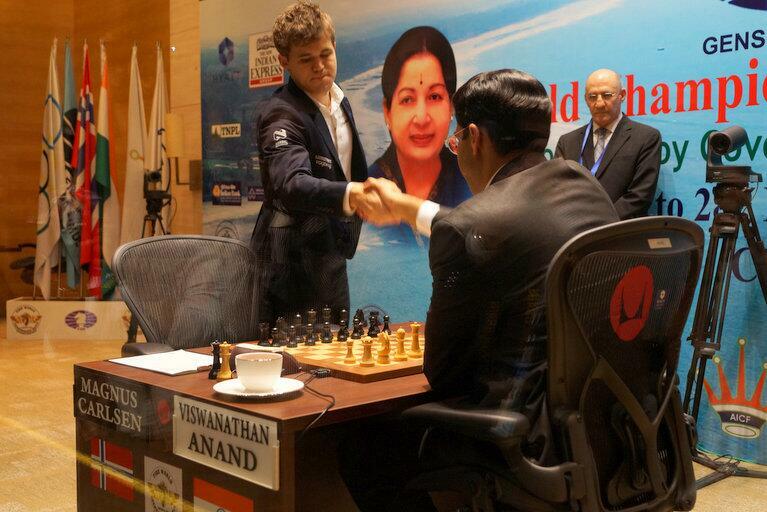 Magnus Carlsen and Vishwanathan Anand shake hands before beginning Game 7 in their World Championship Match. Anand's choice of 1. e4 did come as a surprise to many who thought he would try something different to get an edge with the white pieces in Game 7. Carlsen remained true to his previous outings in this match (except for Game 2 when he payed a Caro Kann) and responded with the ultra-solid Berlin Defense. Anand had very little and the position dwindled down, after all rooks were exchanged, to an endgame with queen, knight and five pawns apiece. Although Carlsen's c-pawns were doubled, that wasn't enough of a pull to inspire Anand to press for the win. After thirty-two moves the position was drawn after repetition. This game brings the challenger one step closer to the goal of the 6.5 points needed for the crown. The match has a "zero tolerance rule" for lateness. What this means is that both players must be seated at the board when the arbiter starts the game clock at exactly 3:00 p.m Chennai time or the offending party will forfeit the game. After entering the match room, Carlsen shook hands with his opponent, sat at the board and then quickly stood up again and went off the stage. At T-minus thirty seconds the arbiter approached the board ready to start the game clock. After a moment to tension, Carlsen came strolling back to the board with seventeen seconds remaining on the match countdown clock. A tragedy narrowly averted. The players are sharing the same rest area room unlike previous world championship matches when each player had his own room. They do have separate refrigerators and separate choices of drinks and foods. Carlsen has been enjoying cashews and orange juice during the games while Anand prefers green tea and plain water. Match officials and organizers on stage with GM Susan Polgar before the start of Game 7. The players' break room. 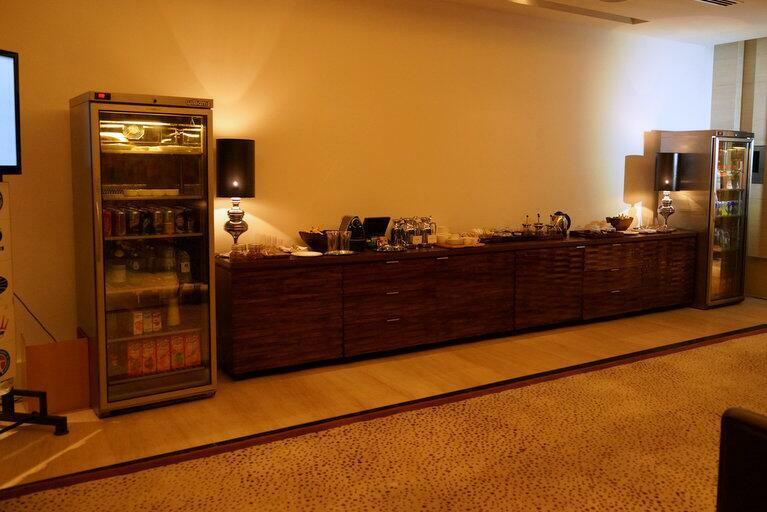 Carlsen's refrigerator is on the left. Notice the gallons of orange juice on the bottom shelf. 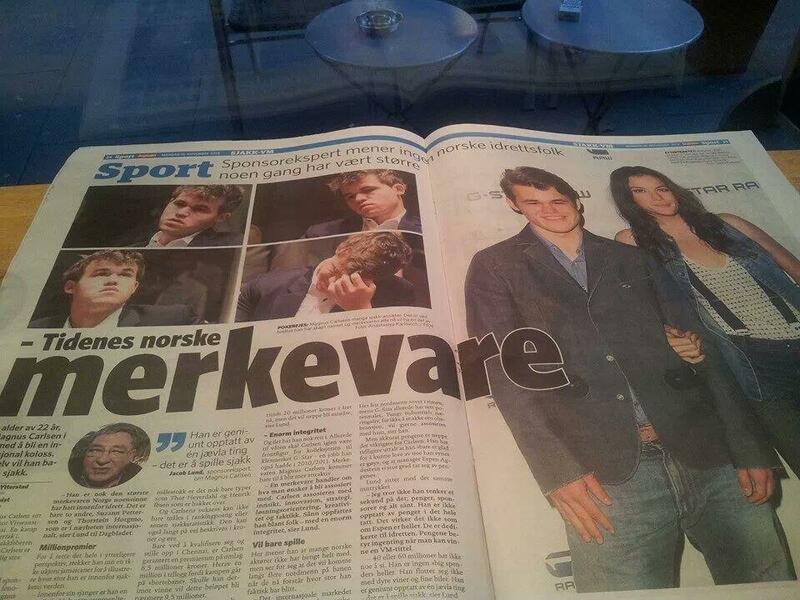 Dagbladet, one of Norway's largest newspapers, recently featured a full two-page spread on Carlsen. The World Champion's monogrammed towels. And, not to be outdone of course, the challenger's towels. All the games of the Match can be found here. Time control is 40 moves in 2 hours followed by 20 moves in 1 hour then 15 minutes for the remainder of the game with a 30 second increment beginning on move 61. Times are on the east coast of the U.S.
11.07.2013 Opening Ceremony 5:30 A.M.
11.09.2013 Game 1 4:30 A.M.
11.10.2013 Game 2 4:30 A.M.
11.12.2013 Game 3 4:30 A.M.
11.13.2013 Game 4 4:30 A.M.
11.15.2013 Game 5 4:30 A.M.
11.16.2013 Game 6 4:30 A.M.
11.18.2013 Game 7 4:30 A.M.
11.19.2013 Game 8 4:30 A.M.
11.21.2013 Game 9 4:30 A.M.
11.22.2013 Game 10 4:30 A.M.
11.24.2013 Game 11 4:30 A.M.
11.26.2013 Game 12 4:30 A.M.